UPDATE: Michael Wayne Pettigrew is in mental custody under Florida's Baker Act following a display of a fake weapon at the Orlando International Airport. According to Orlando Police chief John W. Mina, skilled negotiators talked the man down into custody despite Pettigrew pointing a fake gun at the officers and begging them to shoot him. He also pointed the fake gun at his own head which led the responding officers to believe that he was in mental distress. Pettigrew is a U.S. Marine Corps veteran who served from 2009 through 2012, according to OPD. ORLANDO, Florida - All roads leading to Orlando International Airport have been shut down while law enforcement contains a gunman on the Level 1 A-side near the rental car area. 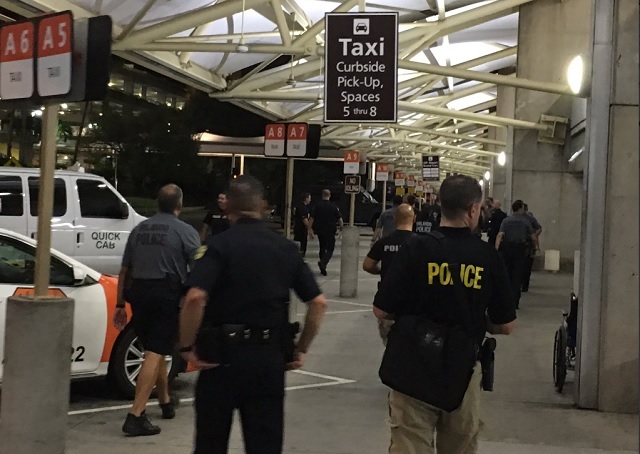 Despite rumors, there have been no official reports of the man opening fire in the terminal. Check back for updates. This story is breaking.